uskin's renovations of older theories of ut pictura poesis are important not only because they indicate both his characteristically eclectic formulation of ideas and his major debt to the eighteenth century, but also because they reveal that romantic poetic theory served as his model for the other arts. We have thus far observed that he applied to painting ideas of poetry derived from Wordsworth and others. These same ideas he also applies to architecture and sculpture. Ruskin, who at the age of sixteen had published a series of articles in The Architectural Magazine entitled "The Poetry of Architecture" (1837-1838), believed that the art of building is in part a language like speaking and writing. In The Stones of Venice he explained that this art has two functions "acting and talking: — acting, as to defend us from weather or violence; talking, as the duty of monuments or tombs, to record facts and express feelings; or of churches, temples, public edifices, treated as books of history, to tell such history clearly and forcibly" (9.60). Significantly, Ruskin's most emphatic assertion that expression is the central principle of the arts occurs in this same work on architecture. The Stones of Venice continually emphasizes "the great principle . . . that art is valuable or otherwise, only as it expresses the personality, activity, and living perception of a good and great human soul.... It is the expression of one soul talking to another, and is precious according to the greatness of the soul that utters it. And consider what mighty consequences follow from our acceptance of this truth! what a key we have herein given us for the interpretation of the art of all time!" (11.201, 220) The consequences which follow from Ruskin's acceptance of this idea are many and include some of his most characteristic views on the art of building. First of all, architecture, the art which shelters man, expresses his needs and his entire nature. As Ruskin explains when he compares architecture to painting, poetry, and sculpture, "A picture or poem is often little more than a feeble utterance of man's admiration of something out of himself; but architecture approaches more to a creation of his own, born of his necessities, and expressive of his nature. It is also, in some sort, the work of the whole race, while the picture or statue is the work of one only" (10.213). Architecture, then, is in some sense a group enterprise, and while it expresses the nature of the architect, it also expresses both the nature of the men for whom he builds and that of the workers whose skill carries out his intentions. St. Mark's, for example, expresses the piety of architects and patrons and the free vitality of the men who carved its capitals and erected its walls. Hills and Saunders, A Window of the Oxford Museum: The Sculptor O'Shea at Work. 1858. Photograph. Source: Facing Works, 16.228. Ruskin, who came to criticism of society through the study of architecture, increasingly concerned himself with the role of the individual worker. As early as The Seven Lamps of Architecture (1848) he wrote that "the right question to ask, respecting all [architectural] ornament, is simply this: Was it done with enjoyment — was the carver happy while he was about it?" (8.218) Great architecture, then, embodies the happiness, the fulfillment, the human activity of the workman. According to The Stones of Venice "All art is great, and good, and true, only so far as it is distinctively the work of manhood in its entire and highest sense; that is to say, not the work of limbs and fingers, but of the soul, aided, according to her necessities, by the inferior powers" (11.201). Ruskin, in other words, wishes to solve the problems of Victorian England and Victorian architecture by making the workman an artist. In fact, one might argue that he became increasingly aware of the dilemmas of the modern age once he realized that the average worker, unlike the painter, had no means to express himself, develop his capacities as a man, or engage in truly useful labor. By the time he wrote Fors Clavigera he had closely associated the role of artist and worker, and according to the eleventh letter to the workingmen of England, "a true artist is only a beautiful development of tailor or carpenter. As the peasant provides the dinner, so the artist provides the clothes and house" (27.186). A romantic theory of art, as we have seen, concentrates on the nature and function of the artist. Ruskin begins with such a romantic theory of the arts, applies its criteria to architecture, and recognizing the plight of the worker whom he considers potentially an artist, moves away from the problems of art to the problems of society. Thus holding a romantic conception of architecture, he judges this art by the same criteria he applies to romantic poetry and painting. A building, for example, should be sincere. As he comments in The Seven Lamps of Architecture, "We may not be able to command good, or beautiful, or inventive, architecture; but we can command an honest architecture: the meagreness of poverty may be pardoned, the sternness of utility respected; but what is there but scorn for the meanness of deception?" (8.60) According to Ruskin, therefore, a building must in general express its structure, materials, and degree of handwork. Speaking of structural deceits, he notes that although the architect is not bound to reveal structure, "nevertheless, that building will generally be the noblest, which to an intelligent eye discovers the great secrets of its structure, as an animal form does, although from a careless observer they may be concealed" (8.61). One should note Ruskin's emphasis here on the "intelligent eye," for he explains that convention may transform something potentially insincere, such as gilding, to a commonplace which all understand. Similarly, "in the vaulting of a Gothic roof it is no deceit to throw the strength into the ribs of it, and make the intermediate vault a mere shell. Such a structure would be presumed by an intelligent observer, the first time he saw such a roof; and the beauty of its traceries would be enhanced to him if they confessed and followed the lines of its main strength. If, however, the intermediate shell were made of wood instead of stone, and whitewashed to look like the rest, — this would, of course, be direct deceit, and altogether unpardonable" (8.61). The need for honesty in building similarly forbids the "use of cast or machine-made ornaments of any kind" (8.60), since decoration, the proper task of the worker, cannot be tacked on at so much a yard. Sincerity in relation to structure expresses the nature of architect and patron, whereas sincerity in relation to handmade ornament expresses the worker as well: if a man chooses things he truly loves and carves them on capitals and moldings, the building thus decorated will bear an impress of the carver's vitality, interest, and sincerity. If, however, the worker — whether through choice or command — carves subjects which bore him, such as rows upon rows of garlands, hunting horns, or cherubim, then the work will be as insincere as it is lifeless. Two of Ruskin's architectural studies. 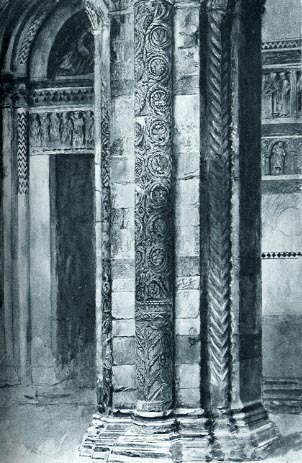 Left: Pillar in the Porch of San Martino, Lucca. Right: Entrance to the South Transept, Rouen Cathedral (right). [Not in original edition.] 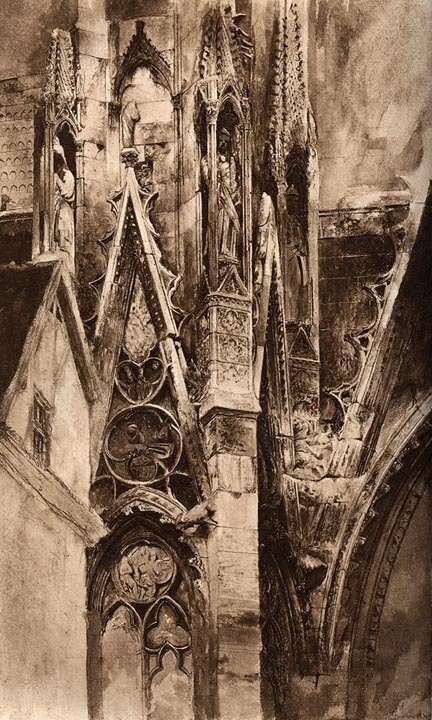 In examining Ruskin's characteristic studies of architectural detail, which are fine works of art in their own right, note how much the sculptural elements play a key role in his love of particular structures. At this point one should observe that Ruskin closely joins architecture and sculpture, considering sculpture chiefly as an adjunct to building and architecture chiefly the art of decorating structure with carving. Much of his criticism of the art of building, therefore, usually concerns the nature of ornament, and it is to this subject that his romantic criteria most fittingly apply. For example, although he made influential pronouncements about sincerity in structure, the chief use of this criterion occurs in his discussion of capitals, moldings, and other embellishments. Similarly, when Ruskin desires originality in building, he wants not the originality of new, fanciful styles but merely the originality that comes from individual work in carving: "Exactly so far as architecture works on known rules, and from given models, it is not an art, but a manufacture; and it is, of the two procedures, rather less rational . . . to copy capitals or mouldings from Phidias, and call ourselves architects, than to copy heads and hands from Titian, and call ourselves painters" (10.207). Imaginativeness, another romantic criterion, enters both the design of the entire structure and the creation of ornament, whereas sympathy, which Ruskin closely associates with imagination, primarily concerns decoration. 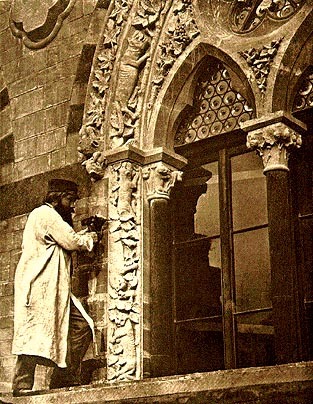 He explains in "The Nature of Gothic" that the great variety of Gothic carving, the profuseness with which the builders lavished natural forms on St. Mark's and the Ducal Palace, expresses a sympathy, an imaginative grasp, of man's "Desire of Change'" (10.2l4). Whereas, according to Ruskin, Renaissance style demands an all too educated eye, the Gothic modes of building frankly confess man's instability and consequent love of variety, and hence provide something which all men can enjoy. For him, a building, like a painting, poem, or statue, must give delight: delight in its many forms is architecture's highest utility. This final criterion, which sums all the others, arises, once again, in Ruskin's conception of poetry. Ruskin's habit of impressing the nature of verbal upon visual art occurs again in his theories of interpretation. He not only believes that the arts function as language to communicate fact, but also that painting and architecture should be read, like poetry, for complex symbolical meanings. This belief naturally serves to join the arts even more firmly in one happy family among whose members poetry acts as an acknowledged elder sister. The Stones of Venice which mentions "reading a building as we would read Milton or Dante" (10.206), explains that St. Mark's "is to be regarded less as a temple wherein to pray, than as itself a Book of Common Prayer, a vast illuminated missal, bound with alabaster instead of parchment, studded with porphyry pillars instead of jewels, and written within and without in letters of enamel and gold" (10.112). Ruskin later adds: "I have above spoken of the whole church as a great Book of Common Prayer; the mosaics were its illuminations, and the common people of the time were taught their Scripture history by means of them, more impressively perhaps, though far less fully, than ours are now by Scripture reading. They had no other Bible, and — Protestants do not often enough consider this — could have no other. We find it somewhat difficult to furnish our poor with printed Bibles; consider what the difficulty must have been when they could be given only in manuscript. The walls of the church necessarily became the poor man's Bible, and a picture was more easily read upon the walls than a chapter" (10.129-130). For a building to serve such a verbal function its users must have prior knowledge of the literature which defines its images. "A building which recorded the Bible history by means of a series of sculptural pictures, would be perfectly useless to a person unacquainted with the Bible beforehand" (9.61). From this recognition follows the principle, central to Ruskin's brilliant readings of art, that one can neither interpret nor criticize the intended symbolism of a work "until we can fully place ourselves in the position of those to whom . . . [it] was originally addressed, and until we are certain that we understand every symbol, and are capable of being touched by every association which its builders employed as letters of their language" (9.61). Throughout his works Ruskin therefore endeavors to set visual art within its proper linguistic context, and this belief in the essential union of word and image produced, as we shall see, not only his fine readings of Turner and Giotto, but also his concern with allegory, iconography, and mythology. Lastly, his theory of the sister arts is important because it led him to devise a philosophy of beauty appropriate to both painting and poetry. His alliance of the arts produced, paradoxically enough, a bifurcated aesthetic, of which one half — which he called "Typical Beauty" — was concerned primarily with visual beauty, while the other — which he called "Vital Beauty" — was concerned with emotional states and their expression. It has often been commented that aestheticians tend to found their conceptions of the beautiful upon the arts with which they are most familiar. Ruskin's concern with painting (and his belief in a visual imagination) led him to formulate his theory of Typical Beauty, which draws its details, if not its ultimate explanations, from conceptions of the beautiful that emphasize qualities most suitable for painting, that is, the visual, the external, the element of form. Vital Beauty, on the other hand, draws heavily on romantic theories of poetry, and on notions of moral emotion and sympathy which are associated with romantic philosophies of art. Vital Beauty, which is the beauty of living things, depends on the internal made external, on expression.